Headed to the nation's capitol for a few days for the National Aging and Law Conference. Staying with my mom. Lunch with dad tomorrow. Audiobooks loaded on the iPAQ. Bag packed. 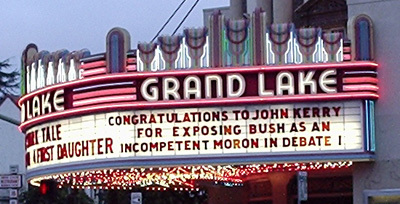 Check this out from Michael Moore's website, a great photo of a movie marguee in Oakland. CA, that is. Let's hear it for free speech, not just the right, but people who actually do it.